My family loves having ribs in any which way... grilled, baked, it doesn't matter. I especially liked these ribs because they had a very nice balance of sweet and heat that the brown sugar and spices used in the rub. 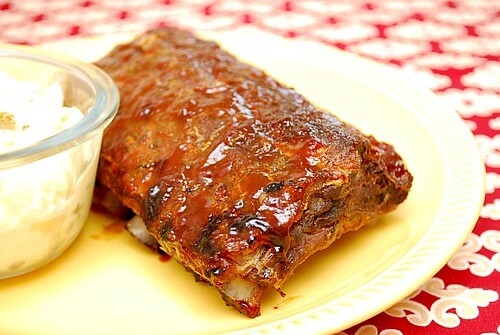 The BBQ sauce adds a nice glaze to the pork ribs as well as seals in the juices to provide truly tender, fall off the bone ribs. You definitely need some patience for these ribs to cook... it's worth the wait, I promise! My son Jack goes crazy for ribs. Even though he is 7, and a really small 7, he can eat an adult portion all by himself! He would love these ribs. They look fantastic Joelen!